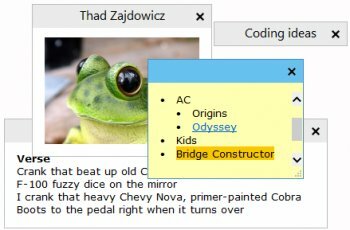 Stickies is a PC utility to cut down on the number of Post-It notes. It stores all information in a single text-based ini file. They are yellow rectangular windows onto which you can put some text notes. Once created, they will stay on screen until you take them away. Just like a real sticky piece of paper. I was pleasantly surprised seeing how feature-rich this applet is. ( Nevertheless, I downloaded and installed two add-on's ...Scoop and Stamper... from the developer's web site. ) Only negative: Some of the options were obscure with poor documentation. Wow! I'm positively surprised... really a great little program! I love to be able to put some stickies to sleep. Very neat how many little things have been taken care of to enhance the user's experience. Nice website too. If you like it and can afford to do so, please donate to keep the author happy. Oops, I take it back. You can either paste text OR an image but you can't mix the two. Still worth 5 stars though. The new betas allow you to paste IMAGES inline with your text. Also has a crapload of other new features, bugfixes and changes and is still completely free. Possibly one of the most-used programs ever on my desktop, next to my web-browser. This may well be the very first program that I *EVER* donate $ towards, I'm that impressed - and I ~don't~ impress easily. Would give this ten stars if I could. The only thing that Notezilla has over this is "tags" functionality - personally I'm sure I'd never use that and it sure as hell isn't worth paying for. The only real competition to Stickies is TurboNote - and that isn't free either. I hereby designate this program as an honorary "FF Pick". It's an OK program, especially for a free one. But I prefer NoteZilla, which is more polished and actually feels more like "real" postits. I give it 4+ because it is the best program of it's type I've seen to date. It deserves better than 4, but not 5 in my opinion. Best free stickies program, imho. BUT I still prefer NoteZilla, simply because it feels more sticky-like. This is one of the most useful applications I have. Simple and efficient. I've been using Stickies for over a year. It's freaking awesome. I wouldn't even bother looking at other post it type programs as this does everything and want and then some. I don't know what the guy below me is talking about, there is no adware here. @ Nighted: Did I say adware? No, I didn't, you have to read more carefully, give it a try and read again I suggest! A very good to excellent program, and free. A hard to beat combination.